PESHAWAR: A couple of tourists from Italy on Thursday visited the historical sites inside Peshawar city and took keen interest in its art, traditional foods and jewellery, cultural items and ancient architecture. 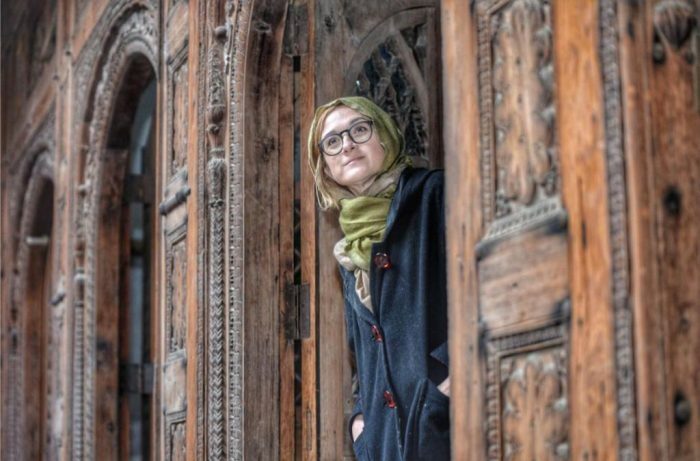 During their visit to various venues of historical importance, the Italian tourists who were identified as Laura and Dara mingled with local people who accorded them a warm welcome inside the walled city of Peshawar. 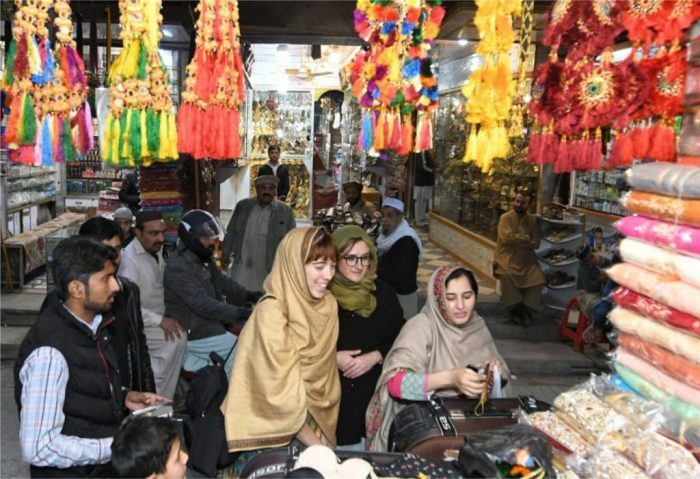 Italian tourists purchase handicrafts at Meena Bazaar, Peshawar. Photo: Tourism Corporation Khyber Pakhtunkhwa. The Italian tourists visited crowded Meena Bazaar, The historic Sethi House, the Cunningham Clock Tower known as Ghanta Ghar, Chowk Yadgar, the Gor Khatri, spicy food outlets in Namakmandi, Heritage Trail and various bazaars in Saddar area of the city. The foreign visitors also purchased cultural and unique items, dresses, golden ornaments and enjoyed traditional foods while visiting different bazaars. Laura and Dara later went to historic Mohallah Sethian to have a look of the marvellous Sethi House. The Sethi Mohallah, also known as Mohallah Sethian, is an old and traditionally arranged neighbourhood in the old city of Peshawar. The Mohallah contains seven mansions built by the Sethi family who resided in the city during 1837-1884. Italian tourist at the historical Havaili of Mohallah Sethian, Peshawar. Photo: Tourism Corporation Khyber Pakhtunkhwa. The mansions were built in a style reminiscent of Central Asia with elaborate wooden carvings. The houses were completed in the late 19th century. The tourists praised the artwork put on display at the Sethi House. The TCKP in the statement claimed that tourists from China, Sri Lanka, Switzerland, Italy and from other parts of the globe are now coming to the Khyber Pakhtunkhwa. The TCKP added that the arrival of foreign tourists to the city of flowers it is due to the efforts being made by the government to promote tourism and attract more tourists to the province.